Garfield Jarrett MSW ’14 has found therapy in farming through the FIU Veteran and Small Farmers Outreach Program. The U.S. Marine Corps veteran served his country for more than 10 years with tours in Afghanistan and Iraq. Sustaining multiple injuries in a roadside attack, the staff sergeant was medically discharged in 2008. Having to forgo a career in the military, Jarrett enrolled at FIU and earned bachelor’s and master’s degrees in social work. Jarrett, who was raised on his grandfather’s sugar cane plantation in Jamaica, is taking his education and recuperation one step further by enrolling in the new outreach program developed by faculty members, Mahadev Bhat and Krish Jayachandran, in the Department of Earth and Environment. The training and access program for government assistance was designed for military veterans, socially disadvantaged and beginner farmers, and nursery growers. 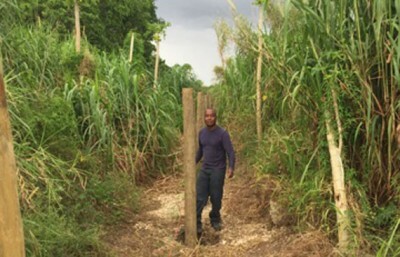 Garfield Jarrett installs fencing in his farm operation in the Redlands, Fla. where he hopes to grow a variety of tropical crops. Students enrolled in the program have the opportunity to participate in workshops on farming business, accounting, marketing, computer literacy, and how to gain access to USDA assistance and grants programs. They also learn technical skills through hands-on activities, including production of tropical fruits, vegetables and nursery plants; beekeeping; composting; and disease management. Their training culminates with a farming apprenticeship at a local farm or nursery operation. The program can be completed in four months and is open to members of the community. For Jarrett, who says he has always been drawn to agriculture, he hopes to learn the technical, business and marketing skills needed to launch and sustain his own organic farm operation. He would also like to use his background in social work to incorporate engagement activities for veterans, at-risk-youth and K-12 students into his farm operation. The Veteran and Small Farmers Outreach Program is a collaboration between FIU, Possum Trot, Redland Ahead, Inc., the Dade County Farm Bureau, and the Coalition of Florida Farmworkers Organizations. It is made possible by a grant from the U.S. Department of Agriculture’s Office of Advocacy and Outreach.